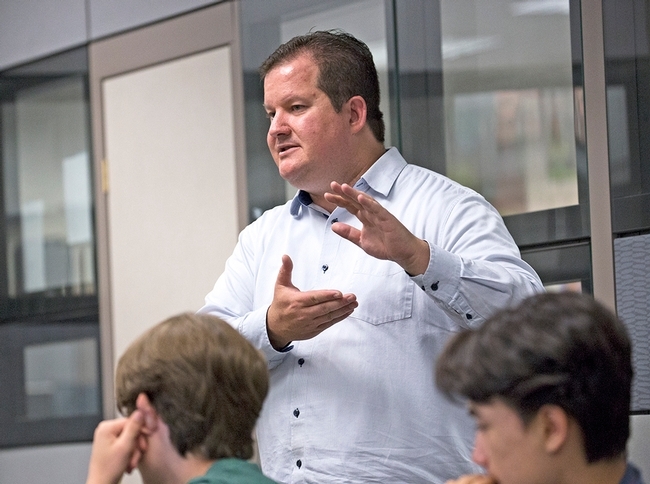 The Verde Innovation Network for Entrepreneurship will connect entrepreneurs statewide to resources to commercialize a new product or start a business. California is constantly being challenged by pest invasions, obesity, labor shortages, water scarcity, food insecurity, climate change and more. To accelerate the development and adoption of technologies that address these challenges and advance food, agriculture and natural resources in California, UC Agriculture and Natural Resources and AgStart will receive a $500,000 grant from the U.S. Economic Development Administration (EDA) to cultivate the Verde Innovation Network for Entrepreneurship (the VINE). 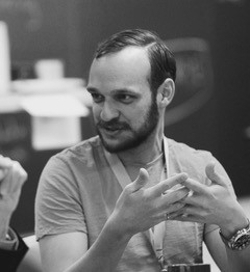 Like a grapevine, the VINE will connect existing clusters of innovation across California and link entrepreneurs with mentors, advisors, collaborators, events, competitions, education and other services to turn good ideas into products and services people can use. 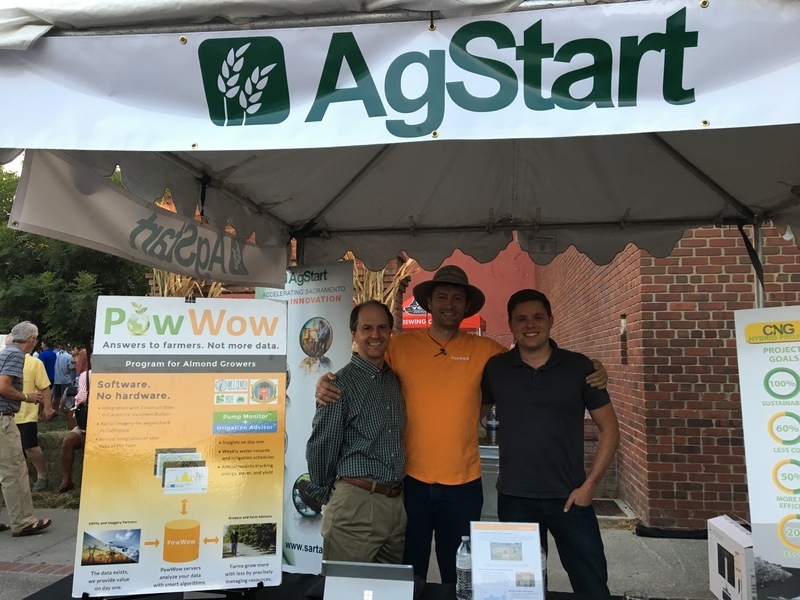 John Selep of AgStart, left, works with Olivier Jerphagnon and Kevin Langham of Powwow Energy, which uses electric utility smartmeters to help growers measure irrigation water use. AgStart itself was established with an EDA i6 Challenge grant to assist agriculture and food technology entrepreneurs in the Sacramento Valley region. Since 2012, AgStart has supported more than 58 entrepreneurs and their companies. “In 2016, of the 16 entrepreneurial companies that AgStart assisted, eight resided outside our region, and leveraged AgStart's program to make connections into our Sacramento Valley region,” said John Selep, president of AgTech Innovation Alliance, AgStart's sponsor. 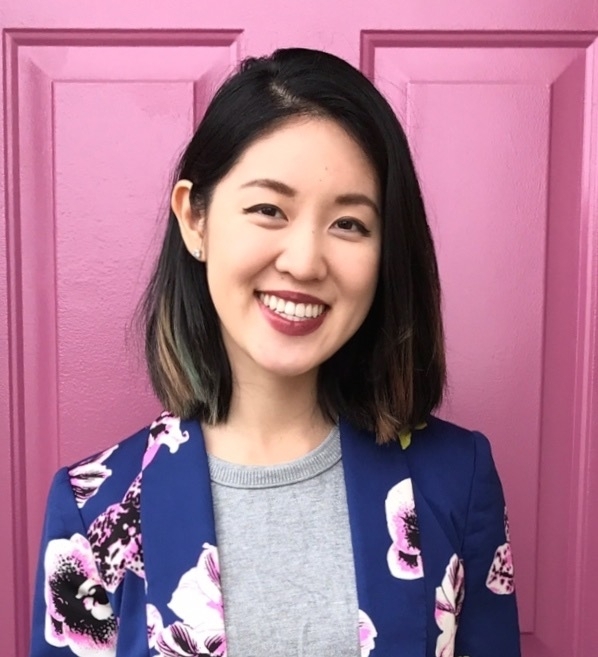 “The VINE will expand this AgStart model of connecting entrepreneurs to the resources they need to be successful, to enable entrepreneurs residing anywhere in California to connect to the clusters of resources, contacts, mentors and potential partners that have emerged across the state,” said Selep. 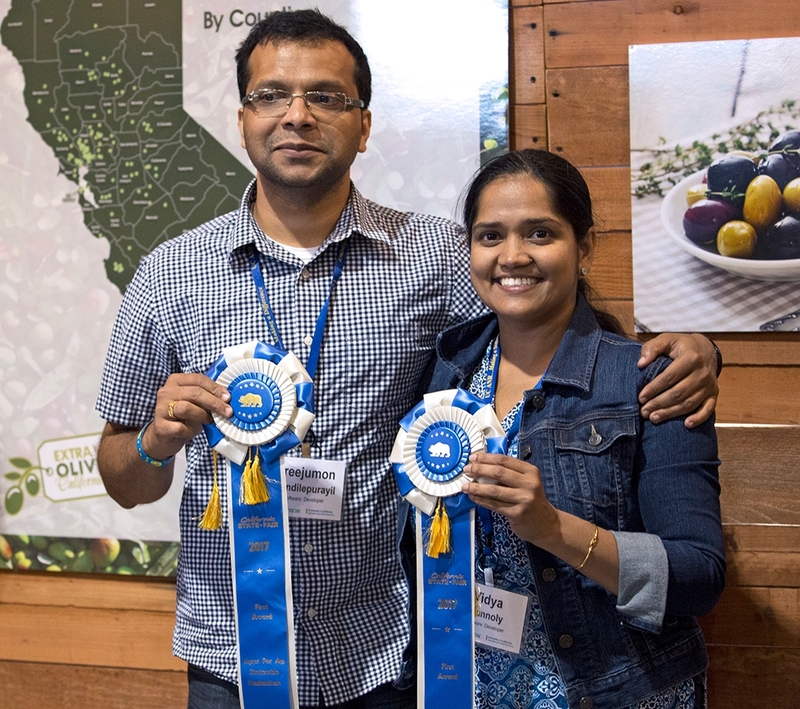 “The VINE is really exciting because of its potential to unite all the regions of California in an innovation ecosystem for food, agriculture and natural resources,” said Gabe Youtsey. Gabriel Youtsey, UC ANR chief innovation officer, said the VINE won't recreate the wheel. “There are many wonderful regional innovation hubs in food, agriculture and natural resources so we plan to bring value by amplifying their efforts, connecting regions and organizations into a more cohesive ecosystem, and bringing value-added resources that ultimately benefit all Californians through the innovations affecting our economic prosperity, food supply and environment,” Youtsey said. UC Cooperative Extension specialists and advisors, who work in every county, can provide insight into real-world conditions that entrepreneurs should consider in the development stage. 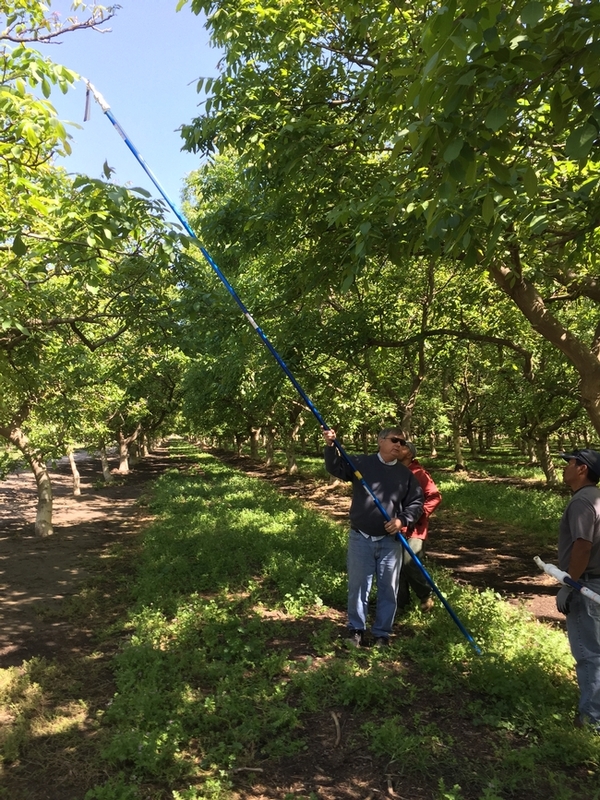 UC ANR's nine research and extension centers can provide locations to field-test products and demonstrate their effectiveness. For example, start-up Blue River is testing its technology by flying a drone over sorghum crops to collect data at the UC Kearney Agricultural Research and Extension Center in Parlier. 2017 Apps for Ag hackathon winners Sreejumon Kundilepurayil and Vidya Kannoly are getting help from UC ANR to commercialize their smartphone app. For the last two years, UC ANR has hosted the Apps for Ag hackathon and has introduced the winners to mentors, tech industry advisors, farmers, funders and legal experts who can advise entrepreneurs on business structure. The VINE, which is working with UC Davis Innovation Institute for Food and Health and Valley Vision, is being structured to complement other efforts to establish food, agriculture, and natural resources incubation and innovation resources in cluster locations around the state, such as the BlueTechValley Regional Innovation Cluster, the Western Growers Innovation & Technology Center, UC Merced's VentureLab and others. Youtsey and Selep are seeking more VINE partners with expertise across the business spectrum. “If our vision is successful, the VINE will make California the most fertile region in the world for entrepreneurs in ag and food technology to establish themselves, to prosper and grow,” Selep said. 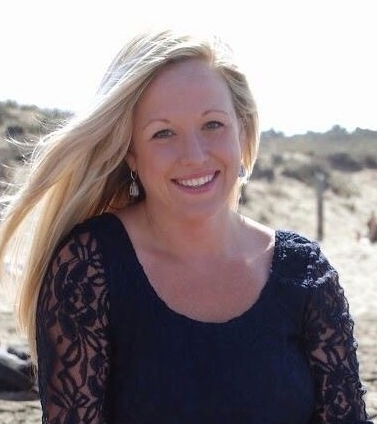 Chelsey Slattery rejoined UC Cooperative Extension on Sept. 18, 2017, as an area nutrition, family, and consumer sciences advisor in Butte County. From 2013 to 2016, Slattery was a UCCE community education specialist, supervising the UC CalFresh Nutrition Education Program in Colusa, Sutter and Yuba counties. From July 2016 to September 2017, Slattery was a program manager at UC Davis Center for Nutrition Schools, where she oversaw a statewide, multi-component, evidence-based, and research-tested nutrition education program. She facilitated training in coordination with the UC CalFresh State Office and UC CalFresh counties throughout the state of California. 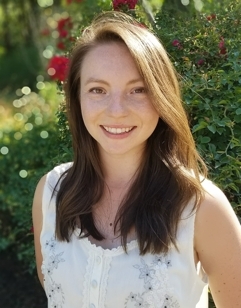 Concurrently, Slattery has been working as a per-diem nutrition specialist since 2015 at Shady Creek Outdoor Education Foundation, where she provides oversight and guidance for the Fit Quest program, bringing comprehensive children's wellness programs to Northern California schools. Slattery earned an M.S. in organizational leadership from the School of Business Management at National University. She completed a B.S. in exercise physiology/exercise science from CSU Chico. Based in Oroville, Slattery can be reached at (530) 538-7201 and cslattery@ucanr.edu. From left, Michelle Prysby, ANROSP president, Sabrina Drill and Marisa Rodriguez. Photo by Michele Richards. 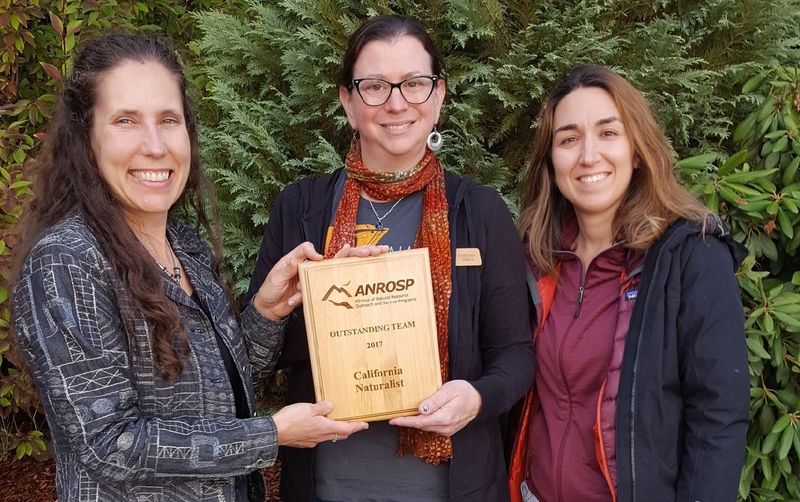 The California Naturalist Program was named the 2017 Outstanding Team by the Alliance of Natural Resource Outreach and Service Programs (ANROSP). Sabrina Drill, associate director of California Naturalist and UC Cooperative Extension advisor, and Marisa Rodriguez, community education specialist with California Naturalist in Southern California, accepted the award on Sept. 21 at the annual ANROSP conference held at the World Forestry Center in Portland, Ore. Led by director Adina Merenlender, a UC Cooperative Extension specialist at UC Berkeley, the CalNat staff includes Greg Ira, academic coordinator; Brook Gamble, community education specialist; Drill and Rodriguez. Teamwork is fundamental to the program structure. Since 2012, California Naturalist has certified more than 1,800 Naturalists, who have logged over 100,000 volunteer hours. The team credits its success to the support and efforts across UC ANR and an extended team of course partners, instructors, statewide partners, educators, scientists, conservation practitioners, and many others who have contributed to the continued adaptive development of the program. On Oct. 19, Joseph Grant, UC Cooperative Extension advisor emeritus, will be among the people inducted into the San Joaquin County Agricultural Hall of Fame at the 33rd Annual Agricultural Hall of Fame Banquet. For most of his career, Grant, who retired in 2016, worked as a UC Cooperative Extension farm advisor and is known for his research on walnuts, cherries, apples, olives and other tree crops. “It's kind of awesome. I mean when you look at the other people that have been inducted into the Hall of Fame, I don't consider myself in that class of people so it's humbling,” Grant said about his induction to the Lodi News-Sentinel. In addition to Grant, the San Joaquin County Agricultural Hall of Fame will honor Henry “Skip” Foppiano, Jack and Pati Hamm and Hank Van Exel, and give a posthumous honor to winemaker Robert Gerald Mondavi. The banquet will be held at the Robert J. Cabral Ag Center in Stockton. Tickets are $45 and can be purchased by calling the Greater Stockton Chamber of Commerce at (209) 547-2770 or by visiting http://stocktonchamber.org/ag-hall-of-fame. Frank Zalom receives the 2017 B.Y. Morrison Medal from Chavonda Jacobs-Young, the USDA-ARS administrator, at a ceremony in Waikoloa, Hawaii. Frank Zalom, UC Davis distinguished professor of entomology and integrated pest management (IPM) specialist, has been named the recipient of the 2017 B.Y. Morrison Medal by U.S. Department of Agriculture/Agricultural Research Service (USDA-ARS). 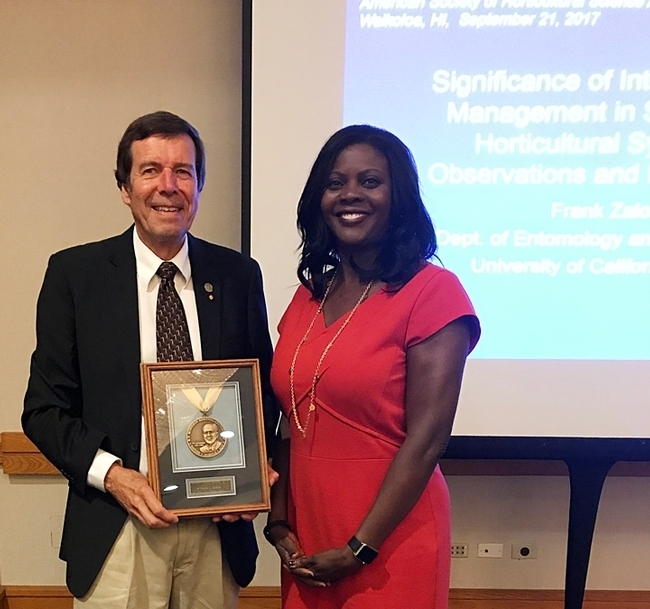 Zalom is the first entomologist to receive the coveted award established in 1968, according to Kim Kaplan of the USDA-ARS Office of Communications. Zalom was singled out for his outstanding work in IPM related to sustainable horticulture production, specifically for “his outstanding leadership and public service in IPM for horticultural crops at the regional, state, national and international levels; his stellar accomplishments in horticultural crops sustainability and pest management and his work ethic, service, courage and integrity, all driven by his insatiable curiosity and passion to solve problems in the horticultural crops landscape,” Kaplan said. 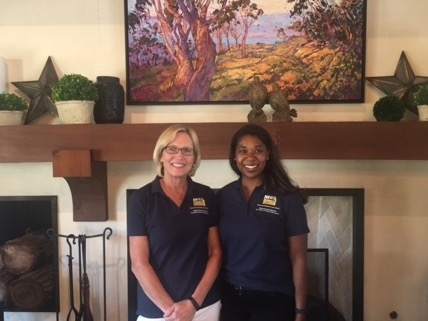 Senior delegate Jeannette Warnert, left, and junior delegate LeChé McGill represented UC ANR staff at the Council of UC Staff Assemblies meeting in San Diego. The UC ANR Staff Assembly Council will hold a Staff Assembly Ambassadors meeting at the ANR Building in Davis on Oct. 10. The engagement will provide an opportunity for ambassadors to visit and network with colleagues and review Staff Assembly priorities. Additionally, they will discuss opportunities for staff to become more involved in addressing staff concerns and furthering organizational goals. 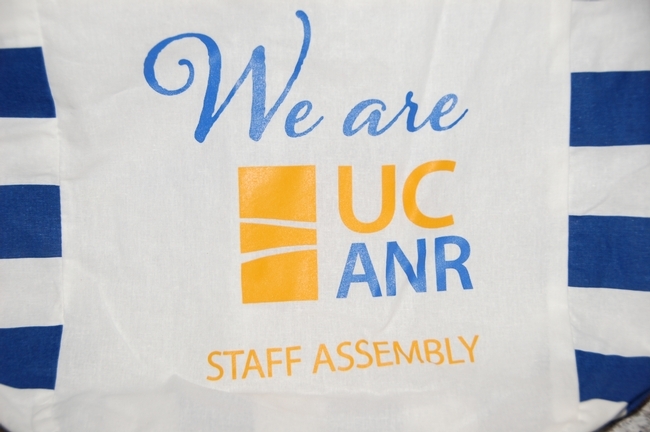 In an effort to help spread the word about UC ANR Staff Assembly, all Staff Assembly members will receive a We Are UC ANR Staff Assembly tote bag. Members of the UC Staff Assembly include all ANR staff, whether employed by the county or the university, represented by a union or not represented. UC ANR Staff Assembly Ambassadors are the points of contact for distributing the bags at each office. UC San Diego was the site of the CUCSA (Council of University of California Staff Assemblies) Fall 2017 Meeting Sept. 6-8. The meeting included a team building exercise, work group action planning, post retirement health benefit discussions and a review of UC Employee Engagement Survey results. UC ANR junior delegate LeChé McGill and senior delegate Jeannette Warnert represented UC ANR staff at the meeting. On the subject of potential changes to post-retirement health benefits, CUCSA chair Lina Layiktez provided the summary below and links for more information. The proposed action item for the July 2017 Regents meeting was to remove the 70 percent floor on the UC contribution to retiree health benefits and place a cap of 3 percent on year-over-year increases to UC costs. This is a policy change to offset the accounting rule changes required in "GASB 75." GASB 75 requires that the full actuarial value of other postemployment benefits (OPEB) be included on the systemwide balance sheet. This means that UC will have a perceived “new” liability of $21 billion, which would affect the system's overall credit rating. A hit to the UC's credit rating has obvious impacts to financing for the university. The “new” GASB 75 requirement definition is subject to interpretation, since it was already a liability that was disclosed in previous year's financials. The value of this liability under current assumptions/retiree rules is approximately $21 billion. The current assumptions are being driven by the number of retirees in the system plus the number of potential retirees (active staff and faculty) and how much it would cost the system in health-care costs should the current employees retire today. By removing the floor and capping UC's costs, the university effectively transfers rising health-care premiums to retirees. The assumed rate of health-care cost increase is 7 percent. Over the course of 20 years this would flip the proportion that UC pays to ~30 percent and the retiree to ~70 percent. The 70 percent floor was designed to provide some stability to retiree health-care costs. What do we see happening? Many UC employees choose to retire after calculating their retirement income. This is necessary because, except for Cost of Living Adjustments (COLA), there is no way for retirees to increase their income from the university. So when out-of-pocket health-care costs go up for retirees, this eats into their living expenses. There are already retirees and survivors of retirees who have to choose between health-care costs and food. To suddenly remove the 70% floor exacerbates this problem. The campus staff assemblies are collecting feedback locally and sharing this up to the Council of UC Staff Assemblies (CUCSA), who will be coordinating a response to the UC President and/or Board of Regents. We are also working on a list of questions that include queries, such as what OPEB would look like if it grandparented current employees and implemented the changes to future retirees? What does this mean for retention of employees with 10 to 20 years of service? The most powerful and helpful thing for us now is to hear about your personal concerns and how this impacts you. Would no OPEB mean you are less likely to retire from the UC system and take a job elsewhere for more money now? Will you have to postpone your retirement if, in retirement, you will have to pay a greater portion of your OPEB than you had planned for under the current plan? Share your questions and stories with us on the UC ANR Staff Assembly website. Fortunately, the July agenda was revised and this item was moved to the November meeting agenda. Moving the item to November will allow for more consultation and discussion. It is unknown what approach the UC Office of the President (OP) will take to solicit feedback and engage in discussion. But as that information becomes available, we will make sure to share it broadly. We are hopeful that CUCSA (and therefore a voice of staff) will be included in the discussions and that OP will convene a task force representing all parties that will be affected by the proposed changes. Stay tuned. Click here for the original July Regents Meeting Agenda Item (F7), which was then revised to remove the discussion on the 70 percent floor. The immediate past chair of the systemwide Academic Senate, Jim Chalfant, has already written a letter to the UC President on this issue. You can read it online here: http://senate.universityofcalifornia.edu/_files/reports/JC-JN-Retiree-Health.pdf. We can work collectively to inform and educate staff on this important matter. We are stronger together and the more voices that participate, the louder the message will be to those making the decisions that affect all of us. If you would like to share your stories or post a comment on this proposed change, please fill out the form on the UC ANR Staff Assembly website. We will share comments and stories from UC ANR with CUCSA leadership, who will compile it with information from other campuses to share with the UC President and UC Regents. UC Berkeley doctoral candidates Jose Daniel Lara, Allegra Mayer and Carmen Tubbesing, UC ANR's Carbon Neutrality Initiative (CNI) fellows for 2017-18, are studying new sources of renewable energy and strategies to cut carbon emissions. The UC President's Carbon Neutrality Initiative Student Fellowship Program, established in 2015, funds student-generated projects that support the UC system's goal to produce zero-net greenhouse gas emissions by 2025. Each fellow will receive $3,000 to fund their sustainability-themed project. Jose Daniel Lara of San Jose, Costa Rica, is a first-year Ph.D. candidate in the Energy and Resources Group at UC Berkeley. Lara aims to determine the feasibility of producing electric power from dead trees. To analyze the resources available from tree die-off, he will develop a method to simulate harvesting of dead trees and evaluate the cost of harvesting dead biomass for electricity production. These results will inform policies regarding the use of biomass feedstocks to generate electric power and help mitigate the consequences of massive tree die-offs in forest communities throughout California. 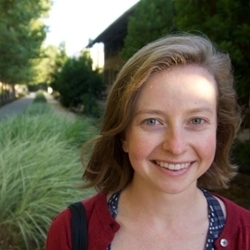 Allegra Mayer of Palo Alto is a fourth-year Ph.D. candidate in the Department of Environmental Science, Policy, and Management at UC Berkeley. 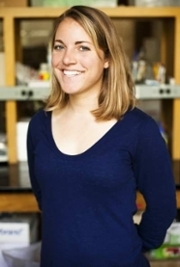 Mayer is studying the potential for storing carbon in grassland soils across California to reduce global temperatures. Allegra will combine laboratory incubations with a state-of-the-art carbon model (DayCent) to measure and predict the effect of compost applications on grassland soil. She will then apply these results to quantify the potential change in grassland productivity and soil carbon storage associated with compost amendments. This will allow her to model the impact of climate change on the carbon cycle at these sites. 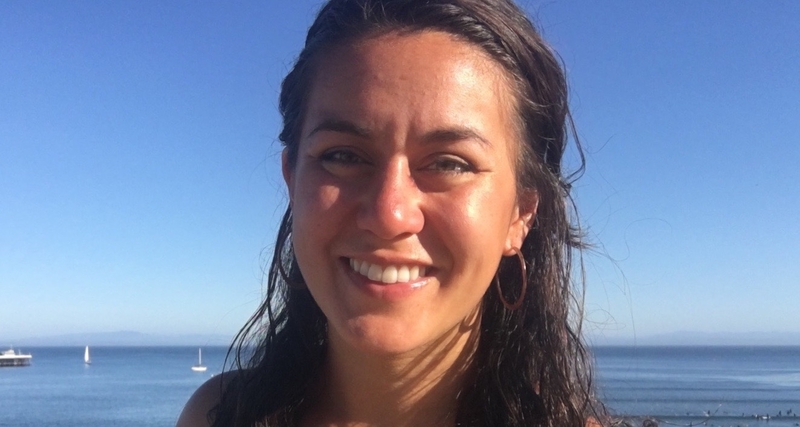 Carmen Tubbesing of Redmond, Wash., is a fourth-year Ph.D. candidate in the Department of Environmental Science, Policy, and Management at UC Berkeley and a fellow in the Graduate Student Program in Extension. The recent California drought led to a massive tree die-off, particularly in the southern Sierra Nevada, that will have long-term impacts on forest carbon storage. To gain a better understanding of the impact of carbon from dead trees, Tubbesing will calculate forest carbon transfers from live tree pools to dead pools between 2012 and 2016. 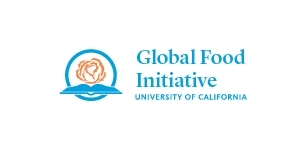 Three University of California students have been selected by UC ANR as Global Food Initiative (GFI) fellows for 2017-18.